Do you need help with nasogastric tube feeding at home? Are you looking for professional carers who highly experienced in NG tube feeding? Do you have other complex care needs now or in the near future? If you are living with a condition that requires nasogastric tube feeding, you may be experiencing specific challenges that require expert help and support at home. At Beacon Support, we will work with you to develop a tailored nasogastric tube feeding plan that is based on your individual needs. We appreciate that there can be a range of reasons for needing nasogastric tube feeding at home and understand how difficult it may be to manage this process and the NG tube feeding equipment. 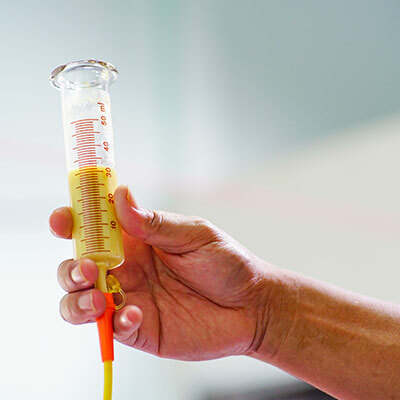 We have many years of hands-on experience and knowledge when it comes to nasogastric tube feeding at home and managing other conditions, ensuring we are well-equipped to help you. We will ensure your nasogastric tube feeding is carried out safely, efficiently and as comfortably as possible. If you are new to nasogastric tube feeding, we will guide you through every step of the process and help familiarise you with the equipment. Our dedicated and qualified carers will develop a nasogastric tube feeding plan based on your specific needs, and any other conditions you may be living with. For instance, we can assist you with everyday activities that may be too difficult to manage alone. Regardless of the difficulties or condition you are living with, we are ready to help you, and will coordinate with other services if needed. Central to everything we do at Beacon Support, is a commitment to delivering nasogastric tube feeding support and other care you can trust. We are focused on you feeling safe and supported with quality care and understanding. It doesn’t matter what happens, we know what to do and will approach every aspect of your nasogastric tube feeding and any other care professionally and with empathy. Your care and support will be provided under the supervision of a Registered Nurse ensuring you receive expert care. We are also a registered NDIS provider. Call us today at 1300 435 782 or contact us via our online form for a consultation or to learn more about our nasogastric tube feeding in-home support and other services we can deliver to you.